Here's an off wire jewelry ramble. Some pictures taken last two weekends during our outings to Serian, Hot Spring and Serikin Market. I have posted about Serikin Market several times here, here, here and here, about Hot Spring here and maybe several other posts but I don't think I have ever posted anything on Serian, a small town (population about 90k+), an hour drive from the city. 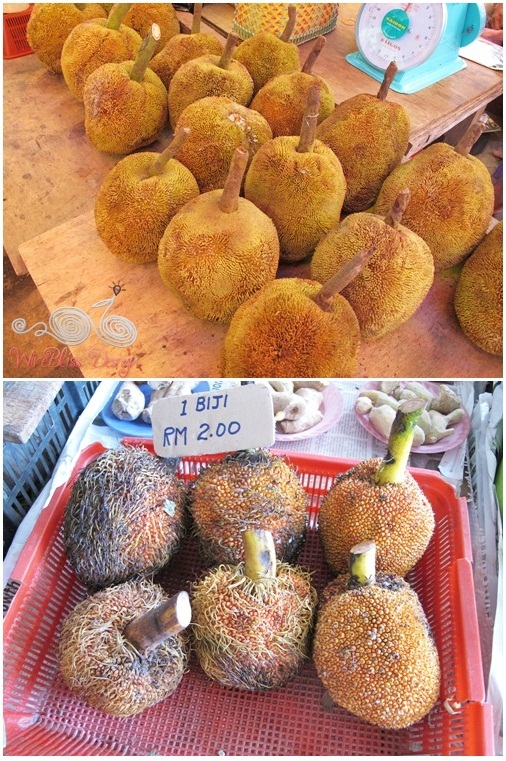 Serian is famous for its durians. That is why you will be greeted by this Giant Durian as you enter the town. As usual, our favorite place to visit is the market. At the time of our arrival, late morning, the whole town was really busy. Lots of people around especially at the market and shops around it. It was a Sunday and most likely people were doing their early Christmas shopping. 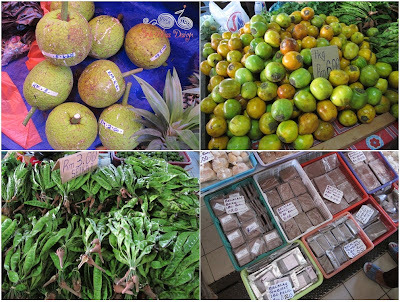 Here are the highlights of the trip, mostly taken at the market. Fruits everywhere...rambutans (the hairy one, top left), mangostene, durians and guavas. All kind of vegetables as well. Ops! 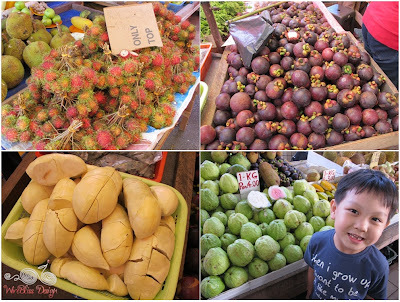 the one at top left is not vegetable, its bread fruit, top right is Terung Dayak (sour brinjal) while bottom left is buah petai (petai beans). Bottom right are the many types of shrimp paste (belacan). This one is an interesting fruit - buah tarap. I didn't know there are two types of buah tarap. Feels like having all of them. 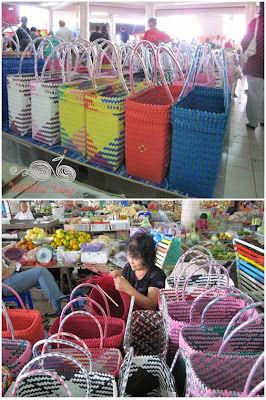 Handcrafted colorful baskets from colorful binders or packing straps. 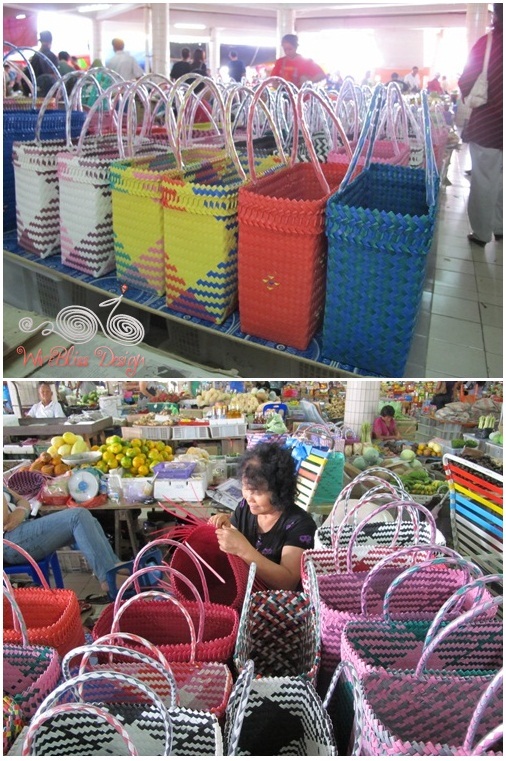 Used to be made from rattan and other natural resources but these are scarce and hard to find due to forest clearing. Sad! Sad! Next we had our lunch at a nearby eatery (forgot the name...). After lunch, off to the river. These are some of the pictures taken along the way. Hill paddy planted by the locals. Very common view along the roads in Sarawak. The region is quite mountainous with winding roads like this. Pepper vines, planted by the locals on small plot of land. Another common view. Swamp or wet paddy, planted on low lying area, unlike hill paddy. The kids having fun at the back of the pickup - just for a short distance. Finally, the river.....nice clear water but its kind of neglegted since our last visit. Tall bushes on the way down...Argh! Geli! 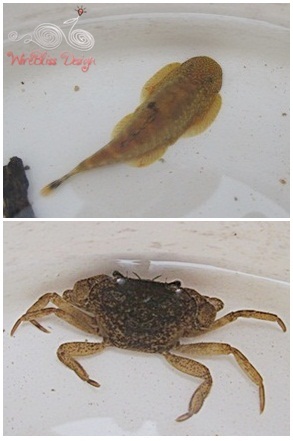 Here's the catches....Borneo Sucker and a tiny crab. Large Geckos for sale at RM50 each. ......with sticky rice cooked in it :) Yummy! Look, with sambal belacan (shrimp paste). One more day left for my Artfire Studio Sale - 25% off all wire jewelry tutorials. Merry Christmas to you and yours Mei...Christmas morning must be such fun with your two boys.